Kajaria is the only ceramic tile company of India to achieve the rare distinction of being a Superbrand for the tenth time in a row, a status shared by only sixty other corporate houses in India. 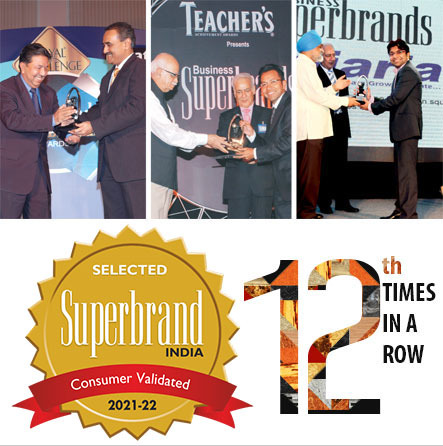 The Superbrand is considered a very prestegious award for branding in India, which the company proudly bagged for ninth consecutive years. The winners have been identified to be the strongest brands in their respective categories and have been chosen from more than 700 shortlisted consumer brands. The Superbrand organization has been tracking the branding phenomenon for over 14 years now. The criteria for selection of the winning consumer brands include perceived brand image plus the brand's mindshare, goodwill, consumer loyalty, trust and emotional bonding. Kajaria - the only Indian Tile company to receive the revered "Asia's Most Promising Brand" award in the Premium Tiles category. The award appreciates Kajaria's exalted journey of becoming the market leader by steady development and presence. Top brand featuring across 50 industry categories had been chosen to form the Most Promising Brand of Asia. The consumer and product survey was conducted by iBrand 360 (Iconic Brands 360), a World Consulting & Research Corporation enterprise. Kajaria has been a pioneer in giving world class premium tiles to its discerning customers and Asia's Most Promising Brands award surely reassures that fact. It is a matter of immense pride and success for a brand when it is appreciated for its undoubting commitment towards its consumers. Kajaria Ceramics is not only India's largest manufacture of ceramic and vitrified tiles. It's also the most trusted. And this has come about because of our unwavering commitment to quality, service and innovation. Little wonder, we have the most certifications from the world's top accreditation bodies. For implementing a Quality Management System for the Manufacture and Supply of Ceramic Tiles. For implementing an Occupational Health & Safely Management System for the Manufacturing of Ceramic Tiles. For implementing of Social Accountability Standards for the Manufacturing of Ceramic Tiles. For implementing an Environmental Management system for the Manufacturing of Ceramic Tiles. For implementing a Food Safety Management System for the Manufacturing of Ceramic Tiles. For Establishing, Implementing, Maintaining and Improving an Energy Management System for a systematic approach in achieving continual improvement of energy performance.